Artwork Panel: 43.3cm x 49cm ≈ 17" x 19¼"
Silk/Brocade Border: 53.3cm x 59cm ≈ 21" x 23¼"
The Chinese characters written on this painting include the year painted (2008) and the artist's signature. 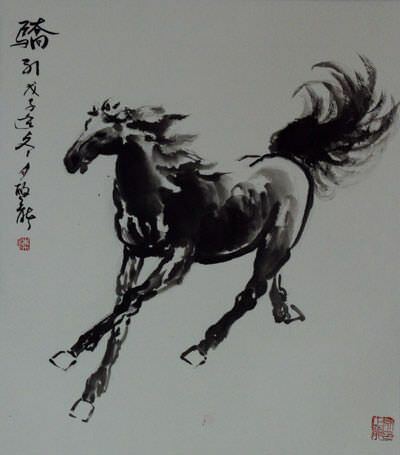 This is a very traditional and famous style of horse painting that is strictly Chinese. 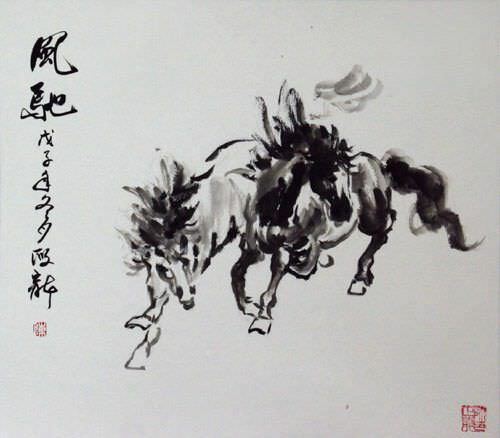 It's done on high-quality xuan paper (rice paper) with only black Chinese ink and a bit of blue watercolor to make the background (no white or gray paint at all). 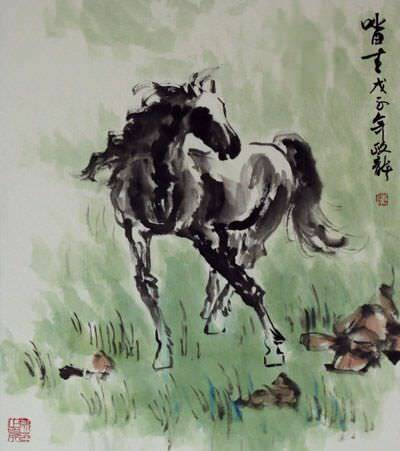 In Beijing, I had this painting carefully mounted with a white silk border so that it is ready-to-frame. 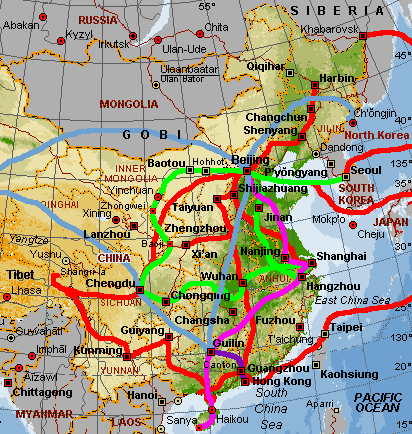 With Korea, Inner Mongolia, Ningxia Province, and Shaanxi Province behind me, I arrive here in Chengdu, the capital city of Sichuan Province and the 7th stop on my art-buying trip around Asia. It has been about 9 months since I last came to Chengdu. And if you know China, you also know how fast things change. Chengdu is no exception. There is a weekend art market here that I discovered on my last trip. It is located near a large building that houses several little antique shops, and tiny art galleries that represent various artists. 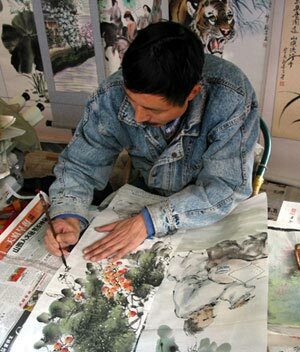 In the last 9 months, the number of art studios and galleries has more than doubled, and Chengdu now explodes with art. As I walk along the outside of the building, some old friends come to greet me. They are the artists that I met on my last trip here. They seem genuinely glad to see me, but of course, some of the cheer in their faces is because they know that I come bearing a large sum of money which will soon be in their pockets. My original plan was to stay only a couple days in Chengdu, but there are so many new artists to meet, that spend more than a week in this city. In Chinese culture, one must first build a relationship before doing business. There is a lot of tea to drink, food to eat, and beer to consume before talking about any business or art purchases. Huang Xin-An is glad to see me as I stroll into Chengdu. He remembers the paintings that I liked the most, and has a stash of them set aside for me. In this picture, he puts the final touches on his work. I usually spend a day or two with each artist. I look at all they have to offer. They often show me photo albums of work that they have done in the past. After I get a good feeling for an artist's style, ability, and personality, I will buy several pieces that they have on hand, and have some others painted custom. I have been known to sit in a studio all day with an artist as they paint one or two pieces for me. 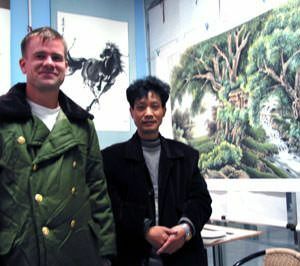 The artists here are often thrilled to know that their work will now hang on walls throughout the world since their usual customers are Chengdu locals, and the occasional Chinese tourist.